If you are often on the go or stressed for time, you may be missing meals. Whether on accident or purpose, skipping meals is not the best way to lose weight and stay healthy. Raynelle Shelley, certified diabetes educator and nutrition consultant at Scott & White Healthcare explains why this negligence isn’t right. Shelley defines meal skipping as going without calorie intake, whether that is solid or liquid, for more than five hours from waking to bedtime. Ms. Shelley says if you go without food for this extended period of time, then when you do eat your body is more likely to hold onto the calories. Think of eating like filling a bucket of water. If it takes three buckets of water, but you’re trying to fit it all in two buckets of water to save you a trip, you will absolutely end up with water all over the floor. “If a person puts more calories in the body than it can use for immediate functions – the excess is going to go somewhere,” says Ms. Shelley. The best way to stay healthy is to feed your body regularly, in smaller portion sizes. It becomes a health issue when you are trying to get the majority of your calories in one or two settings. So, if you are following a 1,800 calorie plan, you will do a lot better in terms of weight loss if you spread that out throughout your day, versus getting 900 calories at two meals. Shelley is a registered and licensed dietician and knows that missing meals can negatively impact your metabolism. Most people who have lost weight require about 20% fewer calories to maintain that new weight than someone who has always been that same adult weight. This means if you have dropped weight to a new 140 lbs., you will require fewer calories than someone who has always weighed 140 lbs. This knowledge will help you avoid putting the weight back on. “The best way to boost metabolism is through aerobic exercise and strength training,” says Shelley. Through planned diet and exercise, you will boost your metabolism and help fight back against health problems associated with excess weight. Wouldn’t it be nice if we all had time to plan, prepare and eat regular meals throughout our day? What we can do is make healthy eating a priority and find a system that will work within our schedule. If you are pressed for time, consider prepping your meals or snacks for the week. This will help you avoid temptations at fast food restaurants, although fruit is now offered at most fast food places. Next time you’re choosing between apple slices and fries, you may opt for the healthier choice. One of the most commonly skipped meals is breakfast. As a dietitian, Shelley works with clients and she tells them to pay attention to how much snacking you are doing after dinner. “That is usually the biggest indicator that they needed something at breakfast,” she says. From research we know that breakfast is important, and we must make time to start our day off right. The National Weight Control Registry shows that 78% of the participants eat breakfast every day and these participants lost an average of 66 lbs. and kept it off an average of five-and-a-half years. Childhood studies show eating breakfast improves math, reading, standardized test scores and improves memory. People who eat breakfast generally get more calcium, dietary fiber, folate and protein than those who do not. There is a correlation in children showing that those who eat breakfast on a regular basis are less likely to be overweight. In adults, there is an association with breakfast skipping and increased prevalence of obesity in at least three studies. 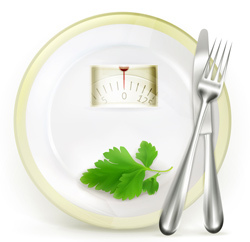 “Skipping meals rarely results in weight loss long term and it can negatively impact the metabolism,” says Ms. Shelley. So next time you’re in a hurry out the door, consider waking a few minutes earlier to fit in a quick breakfast.